We have a bunch of tickets to attend an advance screening of NBC’s new thriller Crisis at the Pearl Theatre on Thursday, March 13th at 7:30 PM. To enter, just e-mail us and tell us your favorite TV show of the moment. Winners will be selected at random, one entry per household. How far would you go to protect the ones you love? Gillian Anderson and Dermot Mulroney star in CRISIS, an emotionally charged new drama series about having to choose between your family and your country. When a group of D.C. high-school students is kidnapped during a field trip, the entire nation is thrown into chaos. That’s because the teens’ parents are some of the country’s biggest power players – top business execs, international diplomats, political luminaries… even the President and first lady. Forced into the unfamiliar territory of being powerless, these high-level mothers and fathers are now at the mercy of one vengeful mastermind who is demanding they do unthinkable things – like jeopardize national security – to ensure their kids’ safety. It will take Washington’s best and brightest to navigate this dangerous game of cat and mouse, and avert a crisis that not only threatens some of our most prominent families… but each and every one of us. 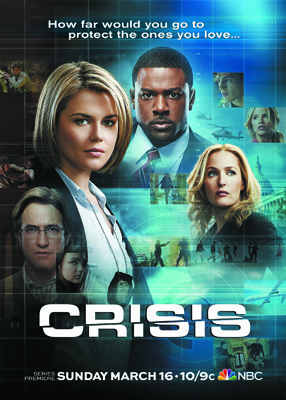 Crisis will premiere on NBC on Sunday, March 16th.